GoPro really needs to watch out. 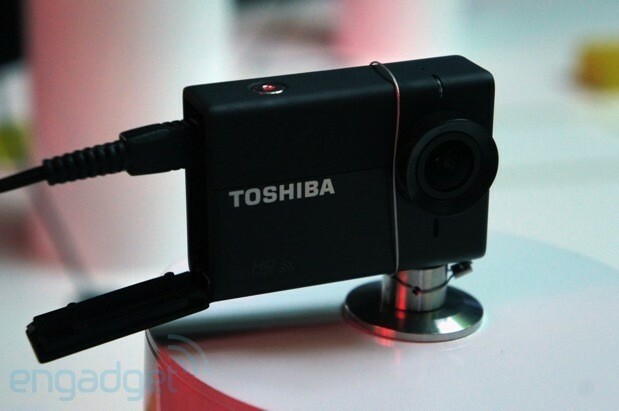 After Garmin, it is Toshiba’s turn to unveil its very own action camera. The Toshiba Camileo X-Sports is a compact, 94-gram camera that sports a 2-inch LCD display, a 12-megapixel CMOS sensor, and the ability to record video clips at 60 frames per second. The device also has ultra-wide angle lens with 10x digital zoom, microUSB slot, mini-HDMI port, and a battery life of up to 1.5 hours when shooting 60fps (over two hours at 30fps). The Toshiba Camileo X-Sports connects wirelessly via WiFi with a smartphone or tablet, turning that mobile device into a viewfinder. Toshiba will bundle its Camileo X-Sports action camera with waterproof casing, wristband remote control, and several mounts. It will be available in Europe in time for the holidays for 250 euros (US$350).